City Living includes three new careers: Politician, Critic, and Social Media. It also brings some new functionality to all three careers, although existing careers are unchanged. All three careers have an optional initial “Work From Home” assignment that is given before your Sim’s first day. They seem to be logical assignments to set your Sim up for success; the Social Media assignment is to create a social media profile, for example. 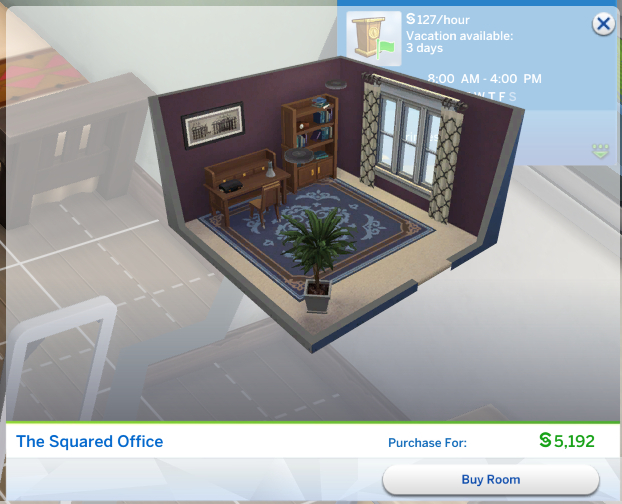 These initial work from home assigments are very much worth taking, as they not only are something your Sim would likely have to do anyway, but they get a little income for doing so. If you’re just starting out in the big city, those extra 40-60 simoleons might make the difference in whether your sim pays their rent on time! Once they’re in a career, an hour before your sim is scheduled to work they get an alarm. They can go to work, work from home, or take a vacation day. If they go to work then they head off lot to work. You cannot accompany your Sims to work in any of the new City Living careers. If you choose to have them work at home they will be assigned some tasks that relate to their career. My political sim had to paint a political mural, for example. For each task they complete they are paid part of their salary. So they can spend the day slacking off, but they won’t make any money for it, and they won’t gain or lose work performance. Now let’s look at the careers. We’ll start with politcs. To be honest, I’ve never really cared for the Political Career in The Sims 2 and 3. I felt like I spent all my time getting my Sim to make and keep friends. I well remember those “Have 20 friends” requirements and the many Sim-hours spent on the phone to acquire and maintain same. The Sims 4 handles things a little differently, though. You don’t actually have to make friends with other Sims – but you do have to talk them into supporting you. My Sim has a fortune aspiration, so I chose Simoleons for Everyone for her because I thought it fit her personality, although there are no restrictions on which I could have chosen. I couldn’t really see a difference in the effects of the different causes. Your sim can also change causes any time they care to, but they will lose the progress they’ve made in gaining followers and donations, so this should not be done lightly. Now that your sim has a cause, it’s time to rally people to that cause! Your sim can talk to their friends, family, and neighbors, and they can also get their message out to the public by demonstrating. The Confident mood is ideal for all the political interactions. Happily, many of the interactions, including protesting, give the Confident moodlet. When you’re demonstrating, passersby will either listen to your sim or not. If they listen, they may be more receptive to joining your Sim’s cause. Your sim will need those followers later, so it’s best to start building a following as soon as possible. Interacting with sims can gain supporters, and chance cards can gain or lose supporters. Your sim will be able to “Check Cause Progress” on the computer once they reach level so they can see how they’re doing. As they gain a few levels they’ll be able to debate politics with other sims, either from “the right” or “the left” If they choose the same alignment as the Sim with which they’re debating, other interactions like promoting their cause or asking for campaign donation become more likely to succeed. If their views do not align, then those interactions become harder. Note that I did not list salaries here. I put two different Sims in the political career to check the two branches, and they ended up with different salaries. Generally speaking, though, it’s one of the better paying careers, which isn’t surprising. At level 5, your activist chooses how they’re going to use the influence they’ve been gathering. They can either become a charity organizer, raising money for their cause(s) or a politician, getting votes, giving speeches, and working their way towards becoming the national leader. First, we’ll look at the career levels for the Politician branch. As you can see from the available interactions, your sim can be an honest politician…or not. Whatever it takes to secure the votes, right? Securing votes is a friendly social, and seems to require a certain amount of friendship between your sim and the prospective voter, so your sim is going to have to spend some time talking up a prospective voter before they’ll agree. They can either promote their policies or make empty promises, which may or may not be believed. It all seems to depend on your sim’s charisma, mood, and the friendship level with the prospective voter. There’s a cooldown on asking a sim for their vote, so it’s worth the time to build up the relationship first. Giving speeches isn’t necessary, but giving a speech gives your sim a confident moodlet, which helps with the one on one political interactions, so I found that giving a speech first then talking to prospective voters after seemed to be more successful than talking alone. Sim elections do seem to be honest, so you only get one vote per sim, and you need a lot of votes to become the national leader. This means your Politician will spend a lot of time talking to other sims. Does your sim prefer to take a more behind the scenes approach to helping their cause? Then perhaps being a charity organizer is for them. They still have to do just as much schmoozing, but they don’t have to get elected to office, just get people to open their wallets. Again, I have not listed salaries here as there seems to be some variance in how much they make, but generally it’s a well-paid career, if a bit less so than the Politician branch. Level 9 CAS Rewards – what spiffy suits! As you can see from these interactions, this branch is primarily about raising money. Confidence is important here, as is Charisma. The goals are high, but once you unlock the interactions you can use all of them on a prospective donor in a single conversation, netting as much as §1,375 from a single Sim in a day. Your Sim will probably still spend the majority of their time talking to other Sims, but you can ask multiple times for donations, whereas in the Politician branch each Sim only has the one vote to secure. Overall, this career is definitely not for the Shy or Loner Sim, as Sims in both branches will be spending the majority of their time interacting with their fellow Sims, shaking them down either for money or for votes. But it can be a rewarding career for your Outgoing/Social Butterfly Sims. There are some really cool clothes and styled room unlocks, too.